In 1945, Gerry Cooper's father died when Gerry was a ten-year-old boy growing up in Tidewater Virginia. His family was financially strapped but Gerry got a scholarship to Christchurch School. This was a time when being 'on scholarship' carried a social stigma and people mentioned it only in quiet voices. When he graduated in 1953 in a class of 13, he had been offered admission and financial aid at two prestigious colleges, Princeton and Yale. 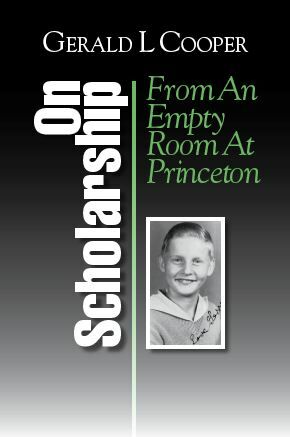 That fall, he went off to Princeton and Gerry arrived to find an empty room. No furniture. No bed. Nothing. Just an empty room. What should he do? "Oh, you just buy whatever you need." The dorm custodian helped him find a used bed and a chair, but this is the only help anyone offered him. He got another shock when he set out to get tickets for the football season, and found that students bought their own tickets and it was more than Gerry had in his checking account. Disillusioned, Gerry transferred to William & Mary and then later to the University of Virginia. He then was offered his first job teaching at Christchurch School, and he spent his life getting revenge—in a benevolent way—raising money for scholarships at various schools and colleges. When I graduated from Christchurch in 1962, I worked as a summer counselor for the summer school which Gerry ran. So while Gerry's first job was teaching at Christchurch, my first job was working for Gerry. We ran into each other at a reunion a few years ago. Gerry mentioned he was working on writing the story of his life, and it's been a pleasure to renew my friendship with Gerry and to work with him on this book. Gerry Cooper can be reached at glcooper1@verizon.net and can be found at his Backyard Studio blog.